APOGEE Acu-Tone™ ~ Vibrational Sound Therapy: YES... " a common dream..." “Shattering Cancer with Resonant Frequencies“. YES... " a common dream..." “Shattering Cancer with Resonant Frequencies“. "...There had to be a better way..." this too, what I was told to bring forward when 7 years of age... I was to tune up the world of people. And so the study of resonant frequencies became my life's work in a myriad of applications. Sound, vibration, energy, as put forth by Ancient Egyptian practices, Traditional Chinese and Indian Medicine, guided my research and integration. For the past 33 years the APOGEE Acu-Tone™resonant/restorative frequencies have brought unprecedented benefits to children and adults. Testimonials speak to the resultant renewed health, stress reduction, pain relief, balance, facial vibrancy and wellbeing. 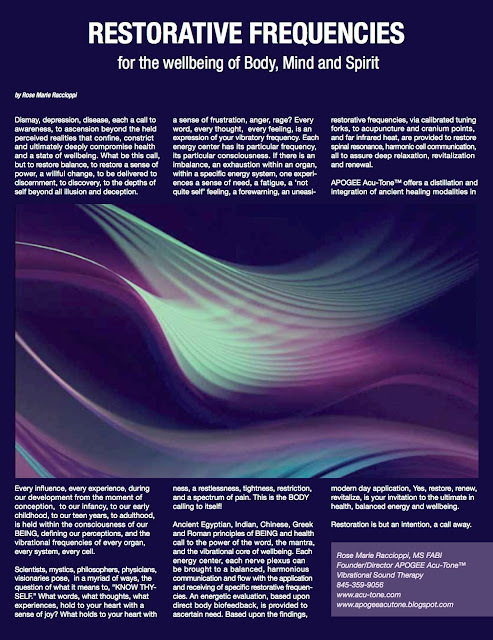 A recent published article: http://apogeeacutone.blogspot.com/…/restorative-frequencies… provides an overview. When reading of this work, and viewing this, Tedx Talk, I was indeed delighted, for it in a myriad of ways not only related to what has been my passion and quest, but to further validate the principles, the premise and the development of APOGEE Acu-Tone™ restorative/resonant frequencies. I encourage you to view this Tedx Talk. Over 34 years ago I was diagnosed with cancer... I have been cancer free, no chemo, no radiation... renewed health through sound frequencies, and the consciousness of the effects of vibration and sound on states of BEING.